Finally the cold is about to be over. As you hit the malls, they remind you that Spring is around the corner! It’s time to start on that Outdoor Spring Cleaning. From Fall to Spring-pollen and dirt, your window desperately needs a clean down. Make sure you take time to wash them down and clean them once the pollen has settled in. A white vinegar and water mix of half and half makes an awesome natural window cleaner. Best to clean when there is shade to keep the cleaner from drying out too fast. Your window screens are very important to clean, since that’s where dirt gets stuck and enters in your home. You can clean the screens by soaking it in a children’s wading pool that is filled with soapy water. As it is soaked, use a soft scrub to take the dirt away. After, you can hose the screen down. If you need to repair the screens because of small holes, you can use coats of clear nail polish. If you have big holes or tears, the best way is replacing it with a new screen. You can be suprised what’s laying on your gutters if not checked yearly. Don’t overlook this project of spring cleaning. You may encounter clogging at the downspouts. So use a plumber’s snake or run water through them. Look for any leaks at the gutter joints and use a gutter sealant to close them when dry. This is a good time to check your roof for any damages caused by the winter season. The Grill is just as important to prepare of the warmer days ahead. Check the burners on gas grills for rust or for clogging. If the outer surface of your grill needs painting, sand first and than use a high heat spray paint. 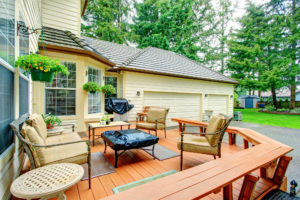 The outer elements can wear down your deck easily if not maintained. If you don’t have a good pressure washer the Annapolis Brothers are professionals in deck staining and power washing. Use a pump up sprayer with a deck cleaner solvent to apply it on the deck. Once the cleaner has penetrated the surface, use a pressure washer to clean it out. If you need to refinish the deck, first apply a sealer or a stain before using the deck. If you have a deck where your family gatherings take place, take a look on deck maintanence and staining. If you want your deck to last longer, you must take the time to keep it in good shape. Can Power Washing Damage Concrete?